We hope you all had a great holiday season and we’re wishing you the best in realizing your hopes and dreams for 2019!!!! To us here on the farm, it seems that the new year is off to a wet start, but that could be because we’re trying to focus on outdoor projects that we set aside when we began diversifying into offering lodging here at the farm. We’re certainly hopeful that the ground dries a bit and we don’t have record rainfall like we experienced in 2018. In reviewing our production records, we see that our yield per acre in 2018 was nearly identical to what we experienced in 2013 which were among our our lowest yields recorded, and many of you are probably aware that 2013 just happens to be the 2nd most rainfall in recorded history, only after 2018. On the bright side in reviewing our records, 2014 was among our best yields over the 20 years we’ve been farming, so we are hopeful that the ground will dry and the 2019 growing season will be fruitful! 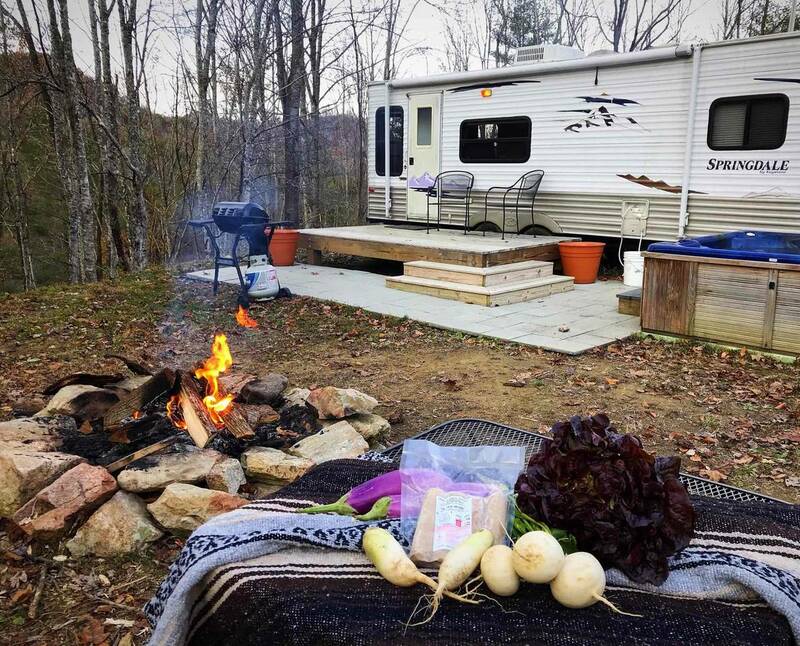 We’re incredibly thankful to have launched our accommodations in 2018 because they saved us from having to sell the farm. 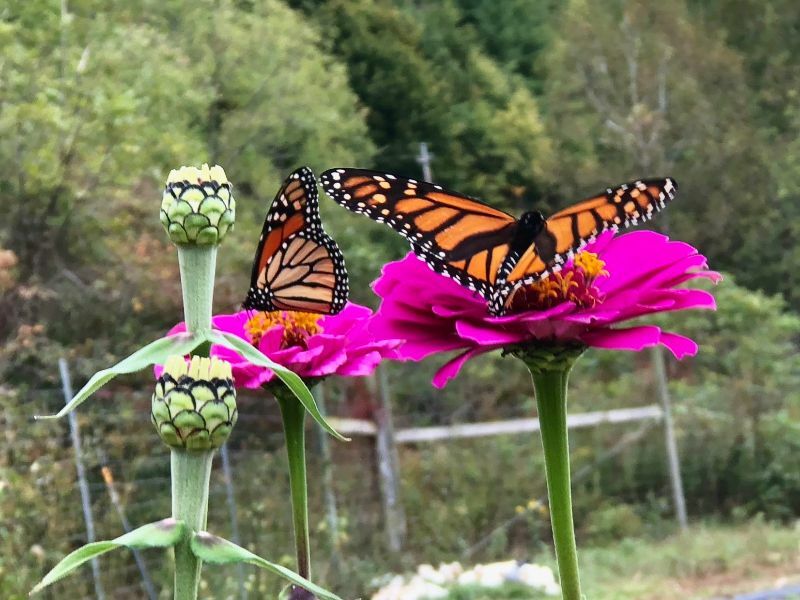 We were surprised that our guests found touring the farm interesting, had such gratitude for the farm fresh food and especially enjoyed exploring our pollinator gardens. We’ve always prioritized planting the pollinator flowers out in the fields among the veggies because of its importance as a food source for the butterflies and bees, so it was nice that guests understand the significance of the gardens. We’ve closed the Thistle Glamping site for the season!! In early December we spent time closing the Thistle Glamping site for the season, just to assure that the water lines didn’t freeze, and to save on our utility bills. That means we’ve disconnected the water lines, emptied the black water tank and drained the hot tub. We’ve filled all the camper p-traps and hot tub plumbing with RV antifreeze and won’t know until April in 2019 if we correctly weatherized the camper. 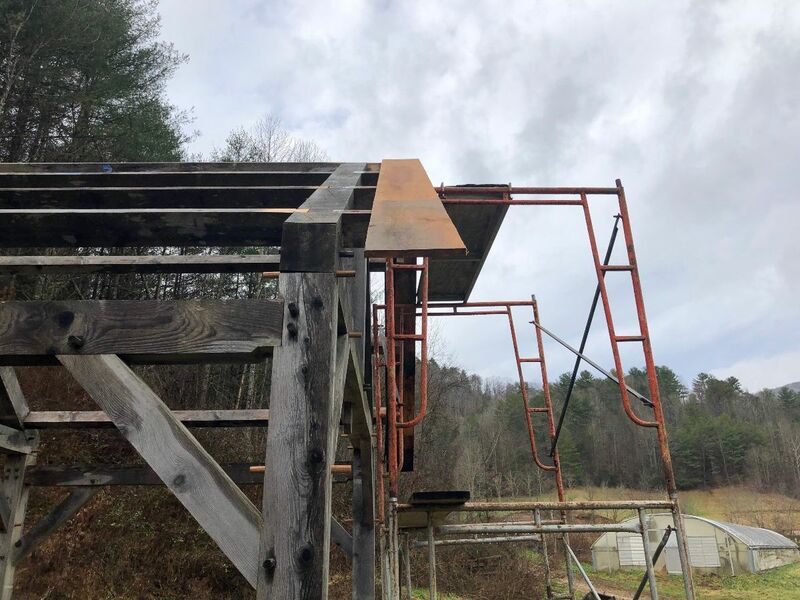 It has been our experience in years past when winterizing the Swallow’s Nest Barn Loft, that there is always some plumbing part that had a little water in, which then froze and had to be replaced. We’re incredibly thankful for everyone who chose to stay at with us this year because your support is helping the aging farmers here transition into Agritourism! While we’re closing this site for the season, we can’t wait to open it again in 2019. 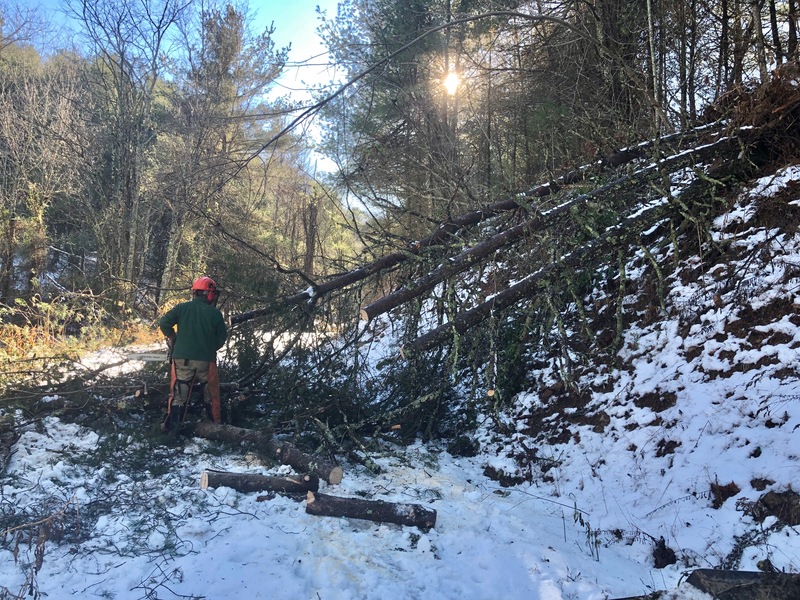 Diego’s heavy snow caused a few downed trees along the road to the cabin!!! We had guests scheduled to stay at the Thistle during Diego; however, right before the storm arrived we messaged them our weather forecast and encouraged them to cancel, and are thankful they did. While we didn’t lose power, quite a few white and virginia pine trees snapped in half, blocking the road. Fortunately, we didn’t have anyone staying at the Thistle, so we could re-prioritize our farming schedule, and clear the road of the debris. We’re glad our guests canceled, because it never crossed our mind of the need to clear the road of snow to the site, and believe that a 2WD car wouldn’t have been able to make it up to the site on the snow packed roads. Lesson learned, we’ll close that site the first of December in 2019, because from our experience in the Mountains we almost always have snowfall in December. We’re finally putting a roof on the pavilion! 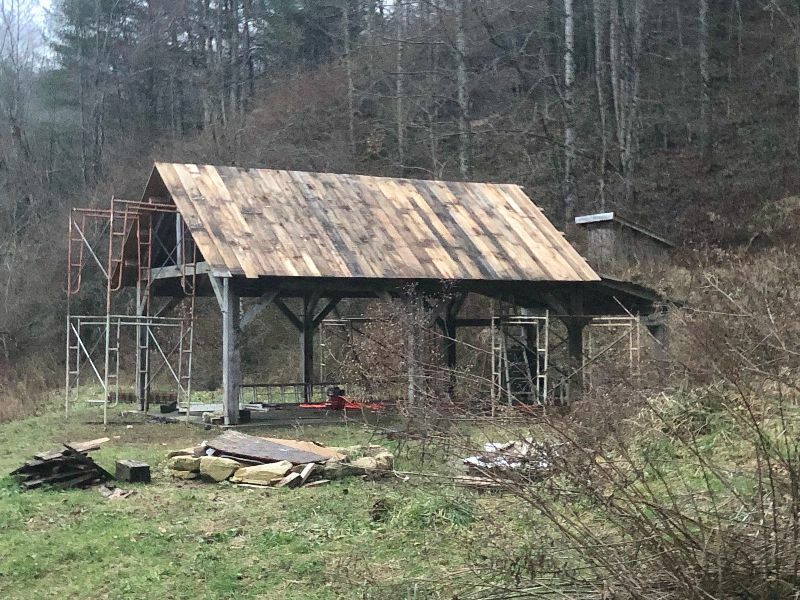 Many of you readers helped raise the timber frame pavilion a couple years ago, and as either you’ve come to the farm to pick up your groceries, passed by the farm, or have inquired about the roof, you’ve seen that we hadn’t yet put a roof on the building. We didn’t want you to waste your time helping us raise it only for us to let it to rot, so we’re proud that the roofing job finally made it to priority #1 on our “to do” list and that the structure hasn’t yet rotted. 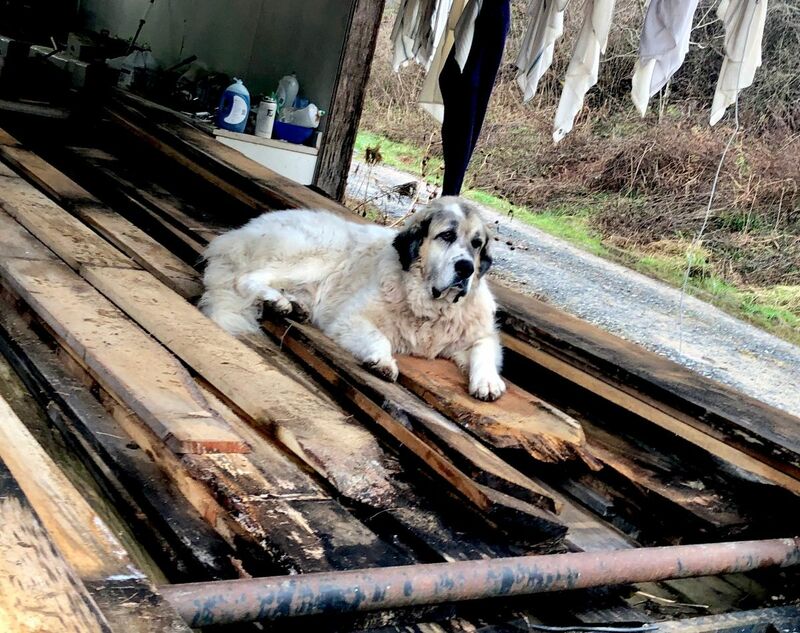 We are lucky enough to have found all the sheathing for the roof down at the sawmill and that it too didn’t yet rot, now that we’ve uncovered it from the weeds, you can see Kaiser has felt the need to guard that lumber. We are thankful to have stickered that lumber after we cut it because it is in good shape. Before installing the sheathing, we needed to determine how long our overhang would be, and thought that we’d like a two foot overhang. So as you can see in the photograph above, we cut a test board but visually the overhang seemed proportionally too long, so we decided upon 16 inches. After that, Julie cut the boards and passed them up to Carl who was at the peak with the nail gun. Above is Carl with the nail gun. 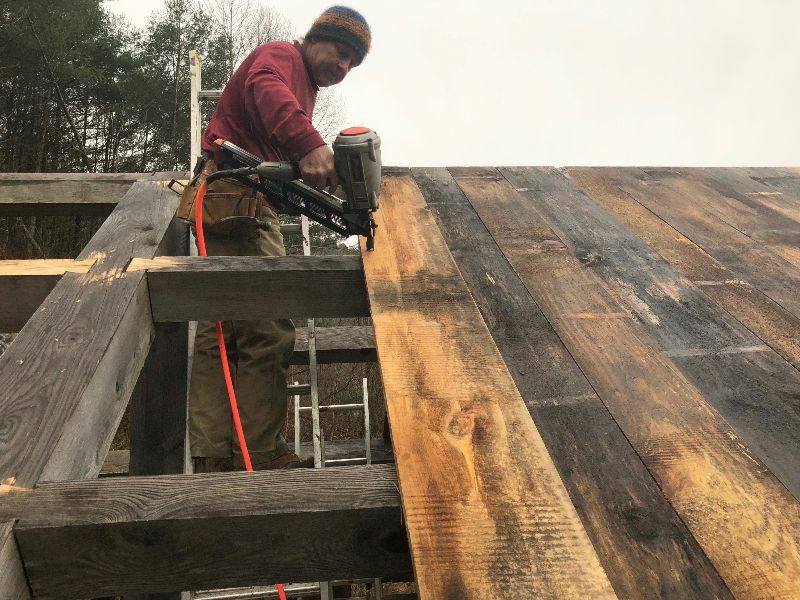 Years ago when we built the equipment barn, Pete Dixon of Hot Springs brought his nail gun and helped us install the flooring for the Swallow’s Next Barn Loft, after that job we invested in our own nail gun which has been a big time saving tool since we do all of our own building projects. Thank goodness Pete helped us with that project, because we learned a lot from him since it was the first flooring project we’d ever done. Above nearly all the sheathing has been installed. 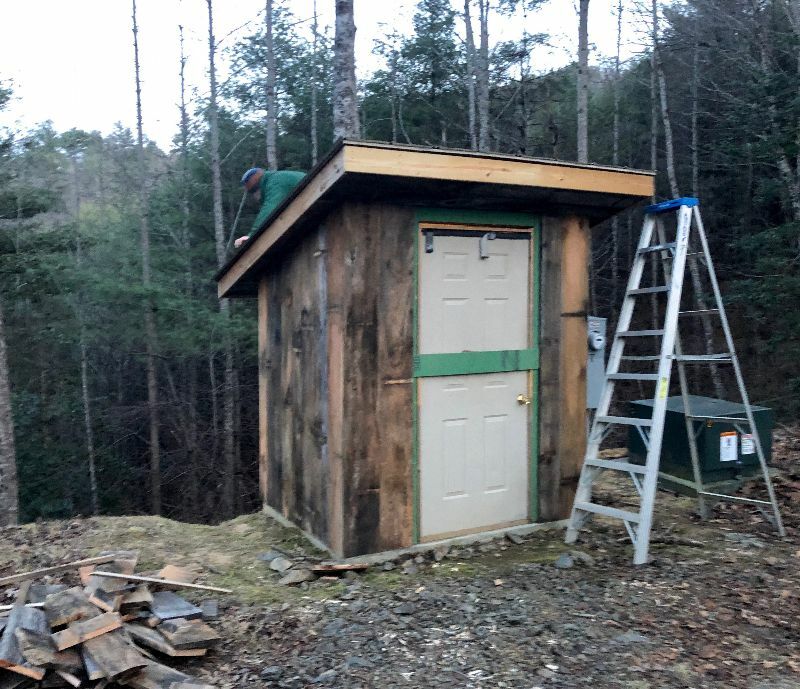 The next phase is to install tar paper and tin, so we are waiting for sunny and non windy weather. 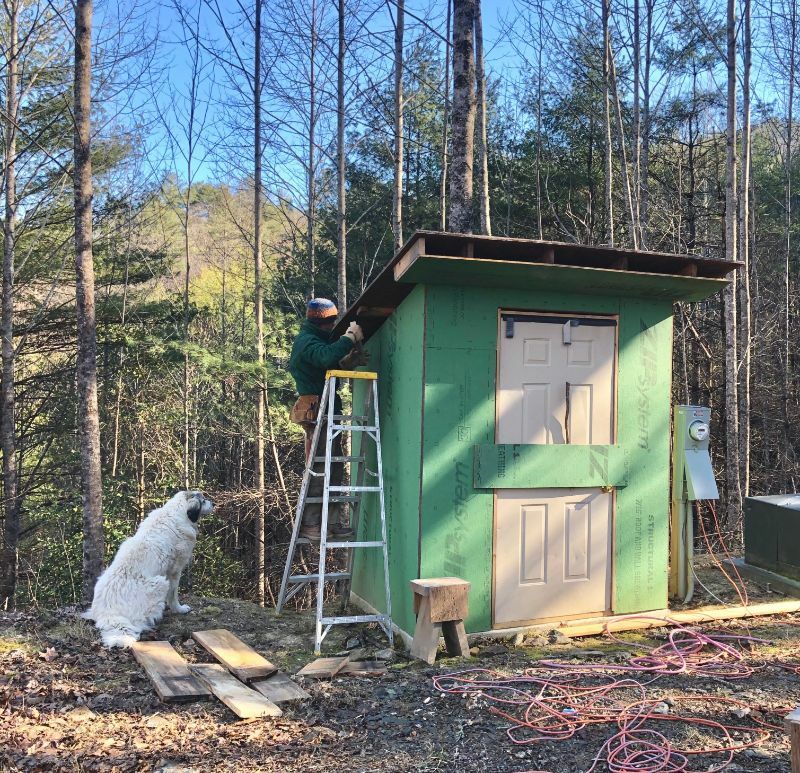 Since we completed installing the sheathing, we haven’t had any consecutive days with good weather, but are hopeful we can report good news about the roof being completed in our next newsletter!!! 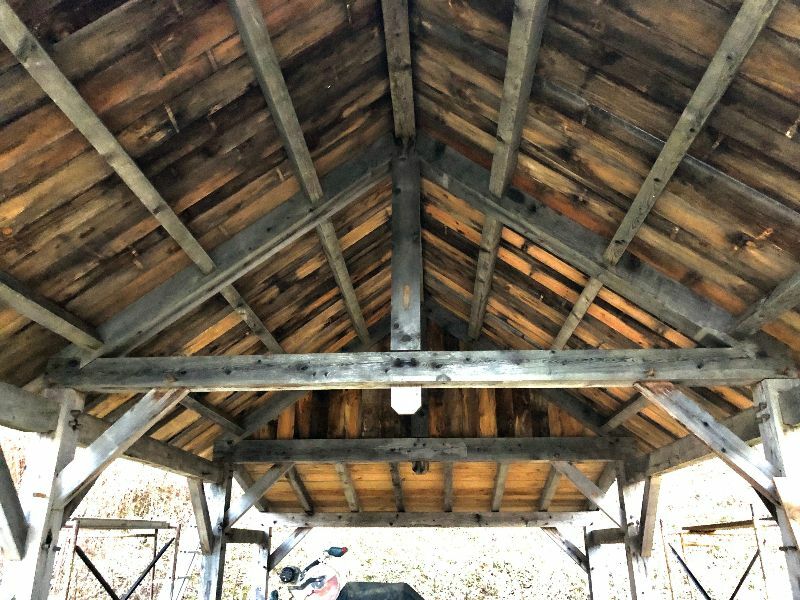 While working on the roofing project, we have even deeper respect for timber frame construction, and why so many old structures still stand so elegantly today much like the oldest known timber frame structure on the North American continent. The oldest known structure is the Fairbanks House dating back to 1637, with clapboard siding and many of its original features intact. After our community raised the pavilion and with the structure left with no nails and only a portion of the pegs installed, when we decided to peg the remaining joinery it was still plumb and had not moved a bit. While spending a lot of time at the pavilion working on roofing, we must say that the humble king post is beautiful joinery. While we have dreams of one day cutting a hammer beam, for now we’ll just be in love with the king post. In between wind, rain, sleet and snow! While we didn’t finish framing the door, we’ll call this project done for the year. Time management is an important aspect when us two old farts are trying to keep this farming operation and our building projects moving along. So we put a time limit on our jobs, but if we ever find ourselves without anything to do, we might just frame that door in!!! We thought we’d post a photo from the fall monarch migration. It seems that winter is full of browns and grays, occasionally sunshine and blue skies, but it is always warms our heart in remembering that warm weather, blooms and pollinators are just around the corner!!! 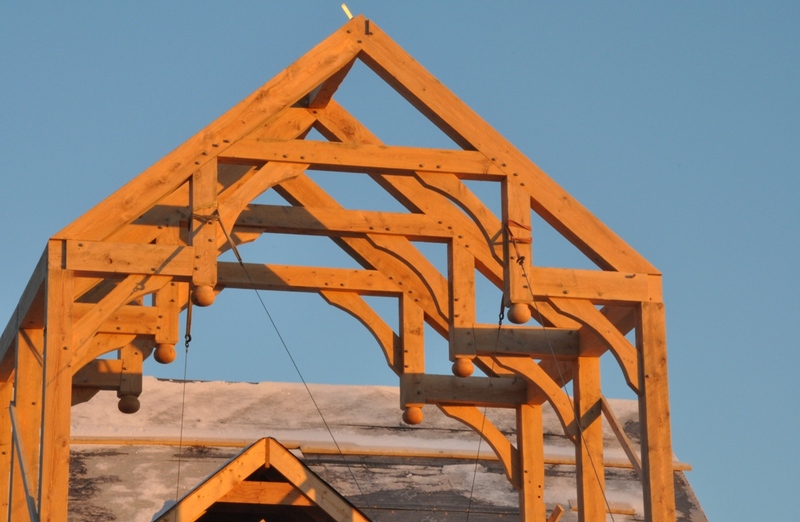 This entry was posted in Timber Framing, Weekly Farm News. Bookmark the permalink. You guys are awesome we had such a wonderful time with you. Thank you for having us this last November.